BEIRUT — An Islamic State suicide bomber targeted a joint convoy of US and allied Kurdish forces in northern Syria on Monday, the second attack against US troops in less than a week. US military Col. Sean Ryan said there were no casualties among the US-led coalition members. He added: “We can confirm a combined US and Syrian partner force convoy was involved” in the suicide bomb attack. 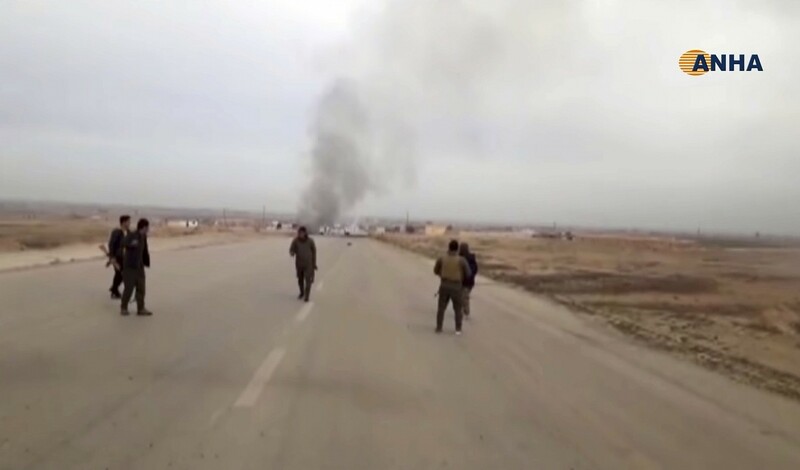 The Kurdish Hawar news agency, based in northern Syria, said Monday’s blast targeted a Syrian Kurdish checkpoint as a coalition convoy was passing near the town of Shaddadeh. It said two Kurdish fighters were lightly wounded in the blast. The Britain-based Syrian Observatory for Human Rights said the blast killed five people and wounded others. Monday’s attack came days after a suicide attack killed 16 people, including two US service members and two American civilians, in the northern Syrian town of Manbij. It also came a month after US President Donald Trump announced his intention to withdraw troops from the war-torn country, declaring that IS had been defeated. Islamic State claimed both attacks in statements carried by its Aamaq news agency. Myrland called these additions to the government guidelines a “further step in the right direction” toward Israel that began with Solberg’s election in 2013. Norway has for years been a major donor to the Palestinians, and chairs the Ad Hoc Liaison Committee that is the main coordination mechanism for development assistance to them. GlobalFirePower ranks Iran as 13th strongest military and placed Israel as 16th, below Brazil and Indonesia. The site also allows for one to compare two specific countries against each other, showing military data such as total manpower available, active personnel, total amount of reservists, and total military personnel. The site also shows the total amount of arms such as aircraft, tanks, naval assets as well as artillery strength. According to the site, Israel’s total military personnel stands at 615,000, compared to Iran’s 934,000. But Iran’s total population is significantly larger than Israel, with 82 million people versus Israel’s 8.3 million people. Jerusalem meanwhile has a defense budget of $20 billion versus Tehran’s budget of $6.3 billion. The United States topped the defense site’s list as the strongest military force, followed by Russia and China in second and third places, respectively. India placed fourth, followed by France and the United Kingdom. In the Middle East, while Israel was outranked by Iran, Egypt (12) and Turkey (9), it continued to outrank other countries in the region, including Saudi Arabia (26), Syria (49), Jordan (76) and Lebanon (106). While the Jewish state placed higher than other Western countries, like Canada (25) and Poland (22), it nevertheless ranked below Germany (10), Italy (11) Brazil (14) and Indonesia (15). Airstrikes against Iranian targets in Syria on Sunday and Monday revealed a new Syrian battlefield that is emerging as the Syrian civil war ends and the US prepares to withdraw. For eight years, since the Syrian rebellion began in 2011, Syria has been the center of great power politics, and an attempt by various forces to control the region through proxies in the conflict. It also became a battlefield between different ideologies, and quests for autonomy amid the chaos and the rise of Islamic State. Now that era is drawing to a close and a new battlefield shift is taking place. The Syrian conflict went through several phases over the greater part of the last decade. What began as a conflict between revolutionaries seeking to overthrow the regime, and reactionaries who sought to keep the Assad family in power, degenerated into a series of different conflicts and contests for who would control the country. Great and regional powers, such as the US, Russia, Iran, Saudi Arabia, Qatar and Turkey all sought a role in Syria. They did so often through backing local forces or proxies. Eventually, with the rise of Islamic State in 2014, the war in Syria became a series of wars within the civil war. This included a conflict between ISIS and most of the other players in the conflict, a conflict between various rebel groups and ISIS and the regime, a rising Kurdish autonomous region in the east and greater involvement by Iran. Israel was at first cautious and operated in the shadows regarding its policy. Only rarely did news of airstrikes emerge, until 2016 when reports in foreign media indicated an increase in targeting of Iranian arms transfers via Syria. For Israel, the main concern was not just who would win the Syrian civil war and thus end up as new neighbors on the Golan, but also how Iran might exploit the conflict to create a direct frontline in Syria between Iranian-backed forces and Israel. Iran was focused mainly on propping up the Syrian regime until 2016, sending militias, some of whom were recruited from Shi’ite minorities in faraway Afghanistan and Pakistan, to fight in Syria. But in 2017, things began to change. It was revealed via satellite images published by foreign media that Iran was constructing sites and stocking warehouses. Iranian “entrenchment,” as Jerusalem calls it, was growing. Washington indicated in 2018 that it shared Israel’s concerns not only about entrenchment, but also about Iran’s “road to the sea,” a corridor of influence stretching from Tehran across Iraq and Syria to Lebanon. This corridor would knit together Iranian-backed militias, many of them established on the Hezbollah model and connected to the Islamic Revolutionary Guards Quds Force. Israel revealed in the fall of 2017 that it had carried out 100 airstrikes against weapons transfers in Syria, and later said in 2018 that this number had increased to 200. Israel also warned Iran against remaining in Syria after the Syrian civil war ended. Iran replied that it had been invited to Syria by the government. This began a complex shadowy and violent dance between Damascus, Moscow, Tehran and Jerusalem. Tehran wanted to stay in Syria. Moscow, which enjoyed unprecedented and increasingly warm and personal relations between Russian President Vladimir Putin and Prime Minister Benjamin Netanyahu, sought to balance its interests. Its main agenda was to help Damascus win the civil war, but it was cautious in that approach. Russia worked on ceasefire deals with the US and Jordan in 2017 regarding southern Syria, and also with Turkey in 2018 regarding Idlib in the north. Russia indicated that Syria’s regime would incrementally take back the country, but that there would be compromises. For instance, Russia played a key role in the return of Syrian army units to areas near the Golan. Reports indicated that Israel continued to warn throughout the summer of 2018 that Iranian forces must keep away from the border. Russia became more clear in its warning to Israel after the Syrian air defense mistakenly downed a Russian IL-20 in September 2018. Moscow said Israel’s actions had created the dangerous conditions in which the Syrians mistakenly shot down the plane. Russia gave the regime its S-300 air defense system and claimed it would train the Syrians to use it. But so far that has not happened. In the recent round of strikes, the Syrians relied on the Pantsir air defense system. As Israel’s winter of discontent about Iran’s entrenchment has unfolded in 2018 and headed into 2019, Jerusalem has become more open about the war being waged in Syria against Iran’s role there. This is a warning to Tehran that Jerusalem takes its actions seriously and that it is not just blustering about Iran needing to leave Syria “quickly,” as Netanyahu said in mid-January. However, the current battlefield in Syria is made more complex by the lack of chaos. This appears counterintuitive. The chaos of the Syrian conflict enabled Israel to act in the shadows because other countries were also participating. But the end of the conflict means more focus on these airstrikes. Peter Lerner, the former IDF spokesman, tweeted that “Israel sent a clear message to Iran that their hostilities from Syria will not be tolerated.” The clarity of the message is clearly related to the US withdrawal from Syria, which was announced on December 19. That appears to have accelerated the degree to which these strikes became more public. Since the September IL-20 downing, reports indicated almost three months of a hiatus in strikes. Then, between late December and the second week of January, Syrian media accused Israel of at least two rounds of airstrikes. Israel took responsibility for one of those on January 13. But the January 20-21 round of strikes was immediately published by the IDF on the morning of January 21. The IDF statement said that “dozens of Syrian surface-to-air missiles were launched, despite clear warnings to avoid such fire. In response several of the Syrian Armed Forces aerial defense batteries were targeted.” The message here appears clear. Despite direct warnings, Syria sought to defend the Iranians and its defense infrastructure paid a price. The new Syrian battlefield is being drawn on a canvas of increased Syrian government responsibility. The Syrian government wants to return to eastern Syrian areas that the US plans to withdraw from. The war against ISIS waged by the US-led coalition, and also by the Syrian regime, appears to be winding down. Hundreds of ISIS members and civilians fled the last ISIS enclave in Hajin on Saturday and Sunday night. Syria’s government is still overstretched though. How can it return to eastern Syria and challenge the growing extremist threat in Idlib, while dealing with a simmering conflict between Israel and Iran? The regime doesn’t want that and neither does its Russian ally. This puts Damascus in a difficult position: the more it defends Iran’s interests in Syria, the more it squanders in its ability to manage the US withdrawal and issues in Idlib. Even with the Syrian battlefield becoming less chaotic and the starker realities of Iran-Israel tensions emerging into a new phase of potential conflict, major region implications remain. Moein Al-Kazemi, a Popular Mobilization Unit (PMU) commander, was quoted as saying that the PMU would respond to any Israeli “aggression.” The PMU is a group of mostly Shi’ite militias linked to Iran’s IRGC. “Any act of hostility against the Hashd al-Sha’abi (PMU) could backfire on Tel Aviv as thousands of missiles in southern Lebanon were already aimed at Israeli targets,” Kazemi warned, according to Iran’s Press TV. The message from Iran therefore is that Iraqi Shi’ite forces and Hezbollah could be drawn into any escalating conflict. That would link the Syrian battlefield to a regional conflagration and Iran’s corridor of influence that Jerusalem has warned about for the past two years.